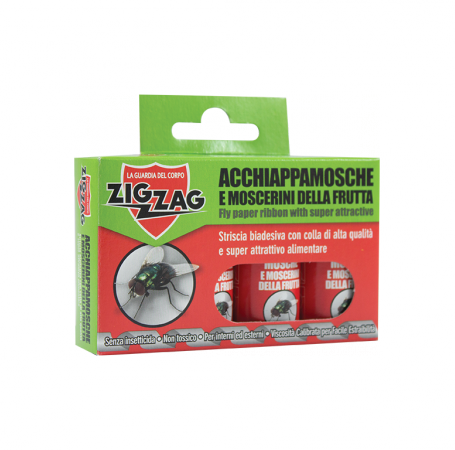 Zig Zag Flycatchers and fruit flies is an effective remedy to clean indoor and outdoor flies. It does not fear water and moisture. Helps clean and care for the environments. 4 double-sided adhesive strips without insecticides, non-toxic with a high attractive power (attracts both males and females). The special glue with calibrated viscosity makes the product extremely effective and at the same time easy to remove from the compass. It does not run even at high temperatures. Adhesive strip with high quality glue and super attractive food. In low temperatures, slightly lower the bushing between the hands before pulling the strip. Pull the red ribbon by slowly pulling the strip up. Hang the strip to a nail or use the dot provided on the cover of the compass. Replace the strip when the glue is no longer active or if the strip is completely covered with flies or dust. As this is a non-toxic eco-friendly product there are no limits to its use! The flies are attracted towards the preglued strip. When they rest on it, they remain trapped.